Different ant species run at different speeds. For example, fire ants (Solenopsis spp.) travel at a rate of nine body lengths per second. Scaled up to human size, this is roughly equal to running 30 miles per hour. However, a number of species surpass these speeds; some can rightly claim to be among the fastest animals on the planet, relative to body size. Some of these species rely on unusual physical adaptations to help them outrun predators, competitors and intolerable temperatures. The world is home to more than 20,000 different ant species but, for a variety of reasons, only a handful of these species make suitable captives. Those that are popular pets are often very adaptable species with generalist tendencies. This means that few species with exceptionally long legs, amazing jaws or other extreme morphological adaptations are kept in captivity. 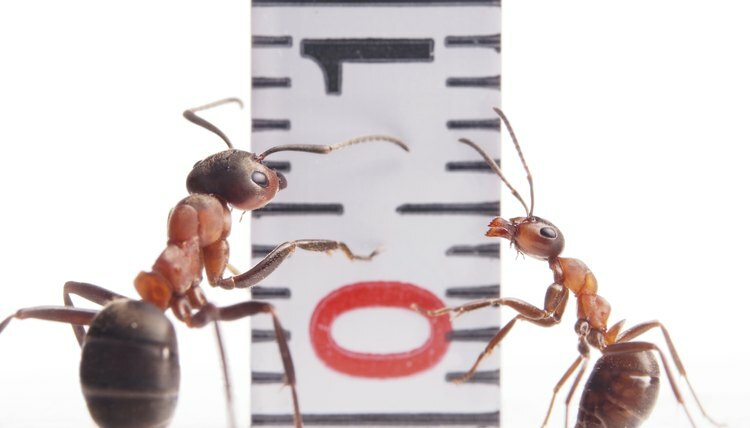 None of the commonly kept ant species, such as harvester ants (Messor barbarus), black garden ants (Lasius niger) or red ants (Myrmica rubra) attain noteworthy speeds. The fastest ants in the world are the Saharan silver ants (Cataglyphis bombycina). Able to travel up to 100 body lengths per second, these ants have evolved their incredible speed as a survival strategy. Living in difficult environments, silver ants must not only cope with the Sahara’s intense heat, but they must also avoid predators. The combination of these factors means that the ant colonies survive by making daily foraging forays in which they collect as much food as is possible within about 10 minutes. Those remaining outside the nest for longer usually die from the extreme temperatures. Trap jaw ants (Odontomachus spp.) are not fleet-footed, but they do possess very fast appendages. These ants, which walk about with their large mandibles spread out, slam their jaws together when something bumps any of the small trigger hairs located between their jaws. The rate at which these insects close their mandibles -- up to 145 miles per hour -- gives them the fastest predatory strike in the animal kingdom. Not common in captivity -- and an invasive species in the southern United States -- Odontomachus bauri also uses it jaws in a locomotor application. When this tiny ant needs to escape a predator, such as an insectivorous lizard, he snaps his jaws shut and rockets himself to safety. During these backwards leaps, the half-inch-long insect may travel up to 15 inches on a horizontal plain or 3 inches straight up. While army ants are not suitable for captivity, they exhibit interesting ambulatory behaviors. The term army ant applies to several different ant lineages who display three key traits: nomadic behavior, highly modified queens and a reliance on collective foraging. While they do not attain very high speeds -- army ants travel about 2 inches per second -- foraging army ants form immense hordes, which collect and consume everything edible in their path. Occasionally, a small subset of the group becomes separated from the rest of the colony. Because army ants are typically blind and therefore follow pheromone trails for navigation, the chaos can create new line leaders. When these line leaders reach an existing pheromone trail, they begin following it, which often causes the entire subgroup to begin traveling in a circular path. This so-called spiral of death perpetuates until the ants starve to death.